The nutritional basis for arthritis is highlighted, along with nutritional remedies. 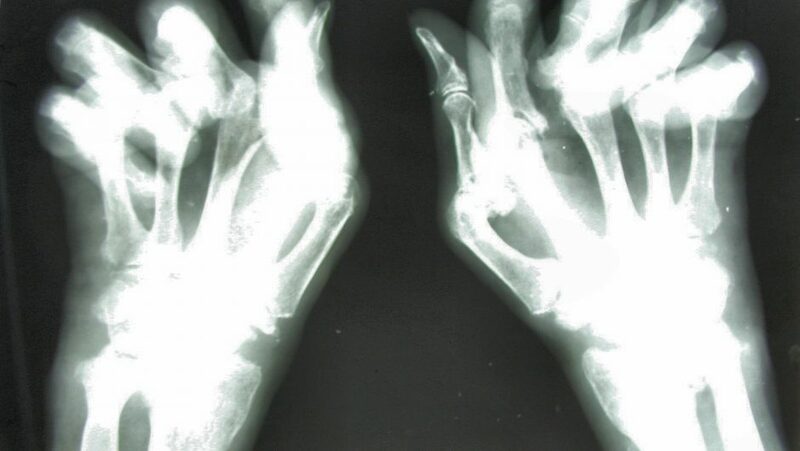 Rheumatoid is an autoimmune illness in which “the body is attacking itself” and destroying it’s own cartilage. The body does not suddenly go after itself, but encounters foreign proteins in the blood. The antibodies it generates for those invaders also “recognize” the cartilage and attack it. The body, being basically intelligent, does not go running around searching for proteins to destroy as a matter of course. (Otherwise, we’d devour ourselves instantly!) However, when the wrong free-floating proteins are found in the blood, the antibodies are generated which wreak havoc. For that reason, arthritis can flare up and die down. It can be in remission for weeks and months, when nothing external causes the antibodies to be formed. Then it can start up again when dietary insults reoccur. Nutritional healing can be effective for this condition. The normal medical protocols, on the other hand, appear to provide short-term symptom-relief, but nearly always result in long-term worsening of the condition, often coupled with nearly unbearable side-effects. [By all means stay in touch with medical progress. If something curative comes along, by all means research it. But medicinal approaches for conditions that have nutritional origins are nearly always doomed to failure. Learn more: Why Nutritional Healing is Effective. Arthritis can be put into complete remission by undergoing an extended fast. (Supervised, for safety.) That works because all dietary triggers are completely eliminated. After the fast, though, a return to the old diet will inevitably result in a return of the condition. Strengthen the system to reduces or eliminates faulty digestion and adsorption. Getting the right kinds of Essential Fatty Acids (govern the permeability of every cell in the body, in addition to the intestines). * I am indebted to Charles Weber for highlighting the importance of potassium. For pointers to his well-researched articles on the subject, see the Resources section at the end of this article. Killing for Profit: Who’s Worse, Tobacco Companies or Food Producers?